10 Pedestrians Killed, Hit By Van In Toronto, Police Say : The Two-Way Fifteen people were being treated for injuries after the incident. A suspect identified as Alex Minassian, 25, has been arrested. A public safety official says there is no apparent terrorist motive. Police inspect a van suspected of being involved in a collision that killed at least 10 people and injured 15 others in Toronto on Monday. Ten people have been killed and 15 injured after a white van struck pedestrians on busy Yonge St. in Toronto today. The driver, identified by police as Alek Minassian, was located and arrested without injury. The police had initially identified him as Alex Minassian. Police Chief Mark Saunders told reporters in an evening news conference that the suspect's motive isn't known but the actions looked deliberate. Ralph Goodale, public safety minister, said there appears to be "no national security connection." He seemed to be making a reference to possible terrorism. Goodale said earlier that Canada's terrorism alert level has not changed, according to The Associated Press. "This is going to be a long investigation," said Toronto Police Service Deputy Chief Peter Yuen at an afternoon news briefing. Constable Jenifferjit Sidhu told the Canadian Broadcasting Corp. that the van might have jumped the curb before hitting people on the sidewalk. The incident occurred at about 1:30 p.m. According to The Globe And Mail, the hospital's emergency department has been on lockdown "as an added precaution." Traffic is being controlled on an avenue by the hospital's main center, and staff met to make sure enough beds were available for the people who were injured. A witness told The Toronto Star that he heard people screaming while he was sitting in his car. "I never heard screams like that before ever in my entire life. People were running all around trying to flag cops down, like running in front of moving cars trying to flag an officer down." Another witness told The Star that the driver of the van was going about 40 miles per hour. A worker in a restaurant near the area where the incident occurred told the CBC, "I just see one man lying at an intersection at Yonge and Kempford. There are ambulances around him and paramedics and cops," she said. "I was just working and then another worker told me a man might have been possibly been hit by a car. I see a man on the ground right now and he hasn't been moving at all." In a written statement posted on Twitter, Toronto Mayor John Tory called it "a very tragic incident." "My thoughts are with those affected by this incident and the frontline responders who are working to help those injured," he said. Prime Minister Justin Trudeau told reporters, "Obviously we're just learning about the situation in Toronto. Our hearts go out to anyone affected. We're going to obviously have more to learn and more to say in the coming hours." 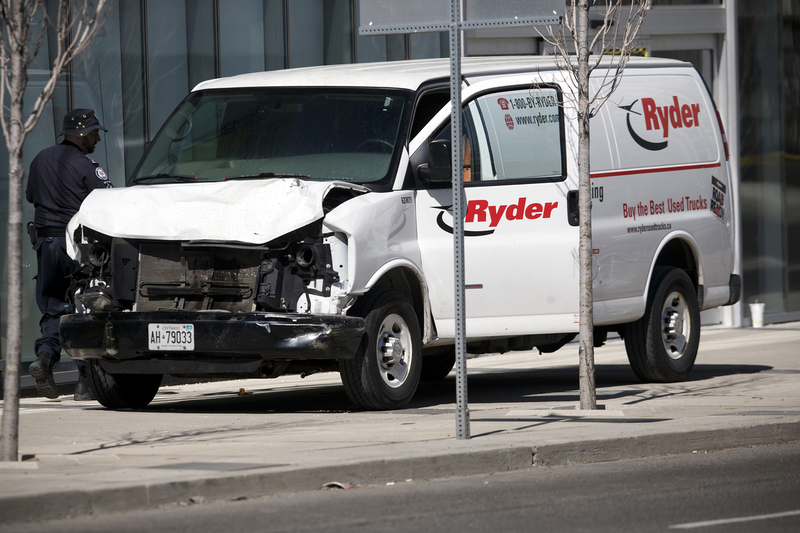 Ryder, the company from which the van was rented, issued a statement according to the CBC. "We are saddened by this tragic event, and our deepest sympathies go out to those impacted." The TTC immediately shut down subway service on a metro line near the incident, according to The Star. The police tweeted that part of the road was closed to vehicles and pedestrians. The police chief warned that the area would be disrupted on Tuesday as the investigation proceeds. All available resources were mobilized, Yuen said. Authorities asked all surrounding businesses and buildings to close for the remainder of the day. They established phone lines for families worried about loved ones and for people with information about the incident. Tory offered words of reassurance that "city is in safe hands at the moment." He told people, "It is a time to be as calm as we can be in the city."